After reading a few bad reviews and hearing that this movie had some off color humor, I didn't have very high expectations. But I was definitely surprised! The movie had a considerable amount of language and innuendo, but as far as content goes, it actually wasn't that bad. And it was a lot funnier than I expected. The story is of 3 boys who are being terrorized by a school bully. 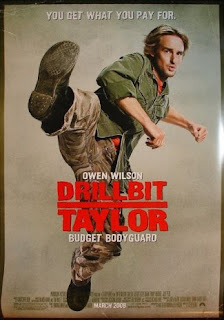 So they hire Drillbit Taylor (Owen Wilson) as their bodyguard. As with most school-bully-as-badguy movies, this one is pretty unbelievable simply for the fact that the bully gets away with everything and there never seem to be any adults around at all when he's harassing the kids. Nevertheless, this is a hilarious movie. Owen Wilson's classic facial expressions and ad-lib humor seal the deal. I think it's one that's going to earn a place on DVD shelves after it's released just because there are so many good quotes and one liners that I definitely think people will be repeating for a long time. Overall, I give it 3.5 out of 5 stars. It would have been higher except for the language.